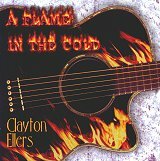 A punk rocker in his own right, Clayton Ellers attacks the Americana/Folk genre with passionate, political lyrics dealing with our government, people's lives, and how the two interact. The music is soft and delicate, giving you a lot of relaxing acoustic melodies, while also standing out far and beyond others of its kind by using a political take on the situations our country constantly finds itself in. Each song touches on a delicate surface, but once it has you listening to the lyrics, you'll be locked inside it's harsh core that has a lot of contempt and weariness for our politicians. And what better way to prove this fact to you than quoting lyrics from "Politician." "We're so weary of being raped, robbed, and pillaged by the people we trust in the store. We'll listen my friend, to your sermons and wind, but we ain't playin' for just dinner and perks," and, "...the money you spend just to buy the drinks, could feed the other half of the Earth. And I hope those drinks will soothe you, cause you're not gonna lean on me," clearly show Clayton's hatred for government waste and secret dealings behind the public's back. With this sort of bottled up rage, hidden behind intricate, delicate Americana music, his words seem so subtle until you've chewed on them and digested them for a few days. Then they hit you like a brick, focusing all your attention on them and getting you revved up for what you can do to solve the problem. Sometimes tackling love and topics of relationships, he always comes back with his lyrical prowl to sharply get his emotions jabbing you in the heart. "When Love Comes Uninvited" boosts the lyrics: "If destiny can be suffered, then I've suffered enough for two, for the way I love you." Never a moment that isn't heart-felt or deeply emotional, his lyrics crawl through hard tales of love, discontent with the government, and people he's seen do things that don't better the situations we've all got ourselves into. With twelve tracks, and over an hour of music, backing up his thoughts, this disc just may be strong enough to back up it's claim of "containing subject matter that may result in actual opinions being formed by the consumer!" I'll give it a B.